Alice Springs has around 300 days of sunshine each year, and averages more than 9 hours of sunlight per day – the perfect location for solar energy solution. With a passion for good customer service, quality finish and solar energy Cartwright & Sun Energy was started independently to give a sense of freedom; which allows our solar installations to be exactly what the customer needs and provides the customer with the best possible service we can. 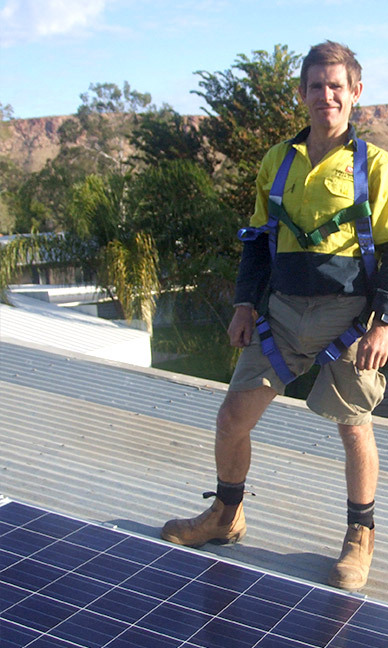 We offer Territorians high quality solar energy, advice and back up service along with fast reliable electrical for all residential, commercial and industrial applications. We undertake every job with the philosophy to do all of the little things that make a big difference to the end result; being on time, to cleaning up before we leave. It is important to us that above all else, the customer is happy with our service and wants to tell others about it. I have been using Ben’s service in my rental property and I’m very pleased with his work. He is reliable, punctual and I’ll definitely use him again if I’ll need electrician in the future. We engaged the Services of Cartwright Sun Energy to undertake some electrical work at our business. Ben was very prompt at attending after our initial enquiry. He provided a quote in a timely manner and once engaged to undertake the required works he attended on time. His work was of a high quality and he was mindful of his workspace and sharing the space with the public, as we were working in an operational shop space. We would highly recommend Ben and Cartwright Sun Energy. Ben collaborated well with other trades and showed a high level of knowledge and broad thinking in his rationale to provide us with electrical services and appliances which were safe and functional for our business. He also provided different cost options relative to different types of products which was also useful in our decision making for the short and long term in our business. Ben’s response and service was timely, efficient and he spent time giving sound advice regarding products and options re: short term and long term life of products. He also cleaned up any mess you made which was lovely.